These three are my world and I could not be prouder of them. They are not perfect and I couldn’t be prouder of that either. 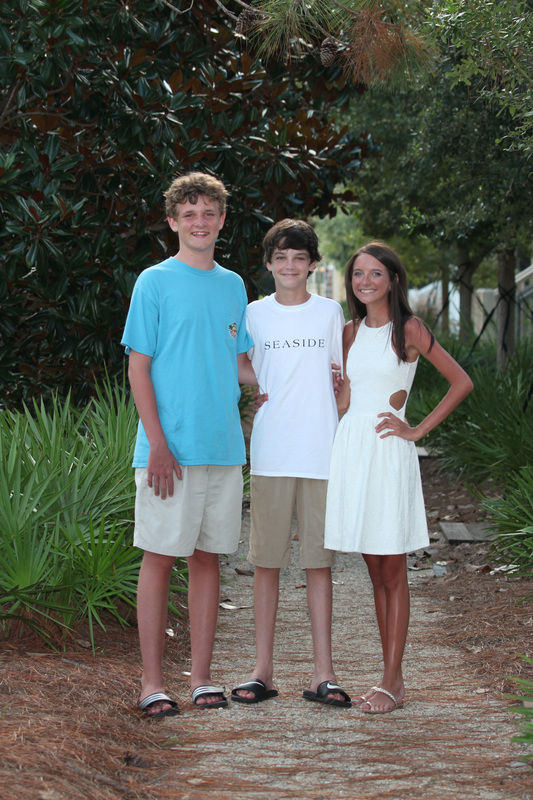 Not one of them fits a formula (Straight A-student, star athlete, Rhodes scholar….). We get compliments all the time on how nice, funny & respectful they are and that is what makes me proud. Their teachers, administrators and fellow peers seem to adore them and that’s important to me. More important than perfect grades, scholarships and accolades. I want them to grow up to be what they want to be. We know more and more people lately who will only finance their kids’ college educations if they follow the plans they think will produce a lucrative job at the end of the line – medicine, law, nursing, accounting, engineering, physical therapy, teaching……..Wouldn’t the world be interesting if those were the only professions we had to choose from? Next time you take in a movie, think of how exciting it would be if Brad Pitt, Steven Spielberg, Clint Eastwood and Martin Scorsese were all partners in a law firm. The next time you get your hair done, think of how you’d look if your favorite stylist thought nursing was her only option. Last year on our family vacation, while paddling in the middle of a lake, I thought, “Wow, thank God someone used their imagination and came up with the Yolo Board!” It takes all kinds. And it takes all sorts of interests and passions to make this wonderful thing we call a world go around. I look at my three children and I see bravery in my girl, the one that broke from the pack and went off to a university where she had no close friends. She sought out and got a job without being told to when we told her we couldn’t squeeze any more out of our budget to help her with expenses. She works hard and she makes us proud. She has always chosen good friends who help round out her life. She has endured people erronously thinking she has an illness, for God’s sake, with grace and dignity. She travels the world with little or no fear, once with two broken toes, and drinks in life fully with every breath. I have no doubt she will succeed in life. I look at my middle child, the free spirit, the one people find hilariously funny…..and I see great things in his future. At his old school, he was routinely dismissed as not paying attention, not giving it his all, sometimes being a pain….. At his new school, he is embraced. They find him hilarious and go out of their way to find things that will interest him and use his abilities for a greater good. He has found a sweet spot in drama and improv and he has developed a heart that makes me proud. On a recent trip to New Orleans, his dad had given both he and his brother $20 to spend. Over dinner, Wyatt asked if it would be ok if he gave his $20 to the struggling musician with the loyal dog curled up beside him. I’ll take that over “straight A’s” any day. I love that at his new school, on many occasions, teachers and administrators have told me, “We don’t know what he’s going to do with his life but we know it will be something successful that we will all remember.” I believe that too. I look at my youngest. My shy one, my introvert. He’s talented at many things, including baseball and cooking. He’s got an eagerness to learn that is admirable and an eagerness to make his money grow that I still do not have 🙂 His attention to detail on projects can be both impressive and frustrating! In many ways, parenting him is my biggest challenge because I take for granted that he’s fairly outgoing like me when he’s actually much shyer and more withdrawn that even HE projects to others. He played basketball for his school this year and gave it his all. No matter what the sport, he’s so fun to watch. I admire that he is generally over a loss by the time he’s off the court or in the car. He likes to have fun and he is good with kids younger than he is. He is funny too. All three seem to have that gene. What’s not to be proud of? Why would I need straight-A’s? Have I told you all how much I hate that phrase? I’ll say it again. I hate hearing how your kid has straight-A’s. Would you like to know why? I’ll tell you anyway. In many instances, those straight-A’s result from pressure from parents and the fear of failure they’ve instilled, whether conscious or not. I hate that phrase the way I hate “gifted and talented” programs, though all my kids took part in them at some time or another, with very little benefit. Take a kid who is naturally gifted at playing concert violin but has a 2.9 GPA. Is he not gifted and talented? Or is he talented but not gifted? WTF does that phrase even MEAN? What about a child who starts a charity to collect shoes for the needy and helps more people than many adults his age but struggled terribly in history and science and only graduated with a 2.5? Does he have nothing to offer this world? People, we are setting kids up for failure when we make them believe they are only worthy if they get into the best schools, have a high starting salary upon graduation and have to reward their parents & grandparents with a long string of successes to brag about. It’s ridiculous. It’s no mystery to me that there is a rash of suicides today among teens and young adults. I feel qualified to speak on this issue because for a long time I was one of those kids. No, I wasn’t suicidal, but I was a high school kid who had a grandparent who talked about me like I was perfect. I did make good grades. I excelled in music. At one point I was the top student in my class, and then the 2nd and then the 3rd and by graduation, the 6th. Why? Because I grew weary of having to keep up the facade of being perfect. I really didn’t think it would affect my lot in life and it hasn’t. I do what I love now. I am a mom, a wife and a photographer, who takes images that hopefully have a positive effect on my subjects, whether I’m photographing a new baby, an engaged couple, a senior in high school or a beautiful woman. I don’t make a fortune. I don’t even promote myself much, if truth be known, because I’m lucky enough to be in a situation where I can pick and choose my work. I’m not a perfect wife or mother by any means, but I think I’m happy. I have my days, don’t get me wrong, when I consider hanging it up and fleeing for the nearest secluded beach. But overall, I’ve got it good. Would I be happier as a hotshot LA attorney with a degree from Stanford? I doubt it. Actually I can pretty much guarantee it. What I do know for sure is that the person who affected my life the most was the one who supported me no matter what I chose or how I failed and not the one who expected me to be perfect. Which one are you? It’s very much in line with what you’re saying, but does so at length with psychological and spiritual rationale for her position. You know, David. I read that before I had kids and it would probably be good to read it again with a parent’s perspective. Good advice! Thank you!